Hosts Samoa beat Japan on the final day of the 2016 ICC Women’s Cricket World Cup Qualifier – East Asia-Pacific to ensure Perelini Mulitalo ended her career with a win. 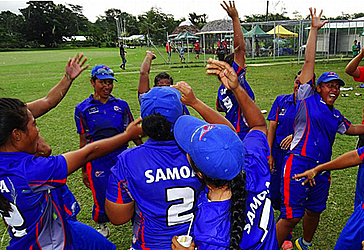 Neither side could progress to the global qualifier for next year's Women's World Cup but nevertheless produced a tight game, Samoa winning by three wickets. Japan posted 135 for eight from their 50 overs. Ex-captain Shizuka Miyaji top scored with 27 while Etsuko Kobayashi made 25. Five run outs - most of them avoidable - hampered their run-scoring while Lagi Otila Telea grabbed figures of two for 23. Samoa started their run chase aggressively before being pegged back. However, Telea struck 49 and Matile Uliao a quickfire 21 to get them back on track. And fittingly, it was Mulitalo who struck the winning runs for the home side, who finished second in the tournament as a result.